SI-CODE is a three year project funded by the European Union FP7 FET (Future Emerging technology) open programme aimed at understanding the state dependency of neuronal responses to external stimuli, and to use this understanding to improve bi-directional communication between brains and machines. Brain Machine Interfaces (BMIs) are devices mediating communication between a brain and the external world, and hold the potential for a) restoring motor or sensory functions to people who lost them due to illness or injury, and b) understanding neural information processing through controlled interactions between neurons and external devices. However, the success of BMIs is hampered by the problem that neural responses to external correlates are highly variable because they depend on the internal state of the neural network. Research in SI-CODE aims to remove this obstacle by developing a radically new generation of "bidirectional BMIs" (which decode information from the recorded neural activity and provide information to the brain by stimulation) employing neural computational strategies and neuromorphic VLSI devices that i) understand how network states influence neural responses to stimuli; ii) use this know-how to discount variability induced by state changes in real time and thus operate with increased bandwidth and performance. 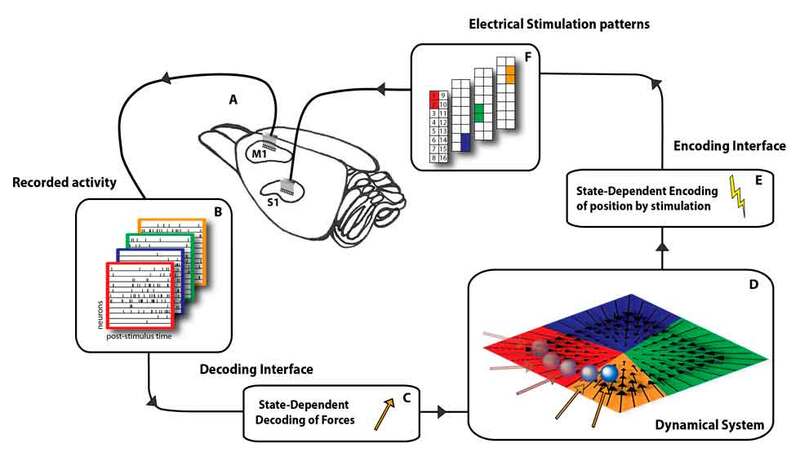 The SI-CODE consortium studies the interplay between ongoing network states and stimulus-evoked responses in various nervous systems of different complexity. The Consortium develops advanced algorithms and models of network dynamics to determine the network state variables best predicting and discounting neural variability, and to construct optimal state-dependent rules to decode neural activity. These algorithms are being implemented in a new "state-dependent bidirectional BMI" prototype using low-power neuromorphic VLSI circuits that extract in real time network state information and use it to produce outputs optimally suited for both decoding of recorded signals and delivering electrical stimulation to a neural tissue in a given state. This BMI will be tested in a benchmark experiment in rats to guide an external device with closed loop control.